We are hiring! Utahns Against Hunger is currently accepting applications for a Child Nutrition Advocate position. Click here to learn more. It takes a village, as they say, to fight to make sure no one goes hungry in Utah. Over the years, in addition to our devoted board of directors and committed staff, many students have helped UAH work — in a variety of ways — to reach our mission. 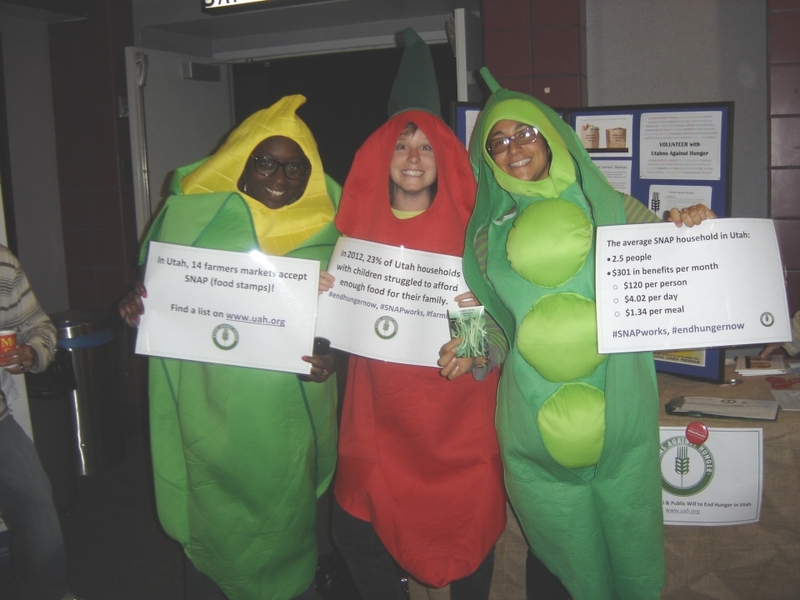 Interns have surveyed teachers about hunger in the classroom, put together resources about the WIC program, and created and run nutrition activities for youth in our farming program. We look for someone who can work independently, take initiative, and is interested in our mission. Interns typically come to our office to work and work around their schedule during the normal work week, Monday-Friday 9am-5pm. If you are interested in the possibility of interning with UAH, please read over our website to understand the scope of our work and then email us to set up a meeting to discuss UAH’s current needs and your interests. Bryn Watkins grew up in Orange, California, but moved to Utah two years ago to attend school. She is currently at the University of Utah, where she will soon finish her degree in Environmental and Sustainability Studies with an emphasis in Food Systems and Community Resilience. While interning at UAH, Bryn has focused on increasing access to local food resources through data collection and analysis. One of Bryn's projects was to update UAH's statewide database and map of community food resources. Bryn hopes that her work will help Utah’s communities better serve those who struggle to afford enough food. Going forward, Bryn is interested in examining the intersection of sustainable food systems and economics. She looks forward to a world that is more socially and environmentally just! Aspen Bias is a rising sophomore at the University of Utah. She is working to complete a Bachelor’s of Science degree in Health Society and Policy, a minor in Nutrition, and a minor in International Studies with an emphasis on Global Health. She came on board for the Summer of 2016 to serve as the Healthy Food Access Intern at Utahns Against Hunger. Throughout the duration of her internship, she focused on promotional outreach for the Double Up Food Bucks program and served as a promoter of the Summer Food Literacy Project by distributing books to children in low income neighborhoods in Salt Lake City. Aspen’s hope is to graduate from the University in the Spring of 2019 and continue on to graduate school shortly thereafter. She hopes to become a registered dietitian whose focus is on nutrition education for the youth of the United States and other countries around the world. Tiana Spurlock is a native Utahn who grew up in Salt Lake City. After receiving her B.S. in Nutritional Studies from Pepperdine University, Tiana enrolled in the Dietetic Internship Program at Marywood University, and worked a rotation at UAH. As a Dietetic Intern, Tiana worked on gathering data on unpaid school meals, assisted the Summer Literacy Program, and helped plan the 2017 SNAP Challenge, including writing the SNAP Challenge Toolkit. "I wanted to work with UAH because I am very passionate about food insecurity, nutritional education, and access to food. I love nonprofit work and can see the benefits UAH has on our community. We should all want to end hunger, but especially as a future dietitian I know the dire need our community and nation has with food insecurity and access to fresh fruits, vegetables, and healthy meals."